The period of industrialization before the first factories came up in Europe is termed as proto-industrialization. This period was marked by merchants from towns getting products made in villages. Reasons for focus of merchants on villages: There were powerful trade and craft guilds in urban areas. These associations controlled competition and prices and prevented entry of a new player in the market. Because of them, it was difficult for new merchants to set business in towns. The merchants supplied money to the peasants in the countryside. They motivated them to produce products for an international market. Land was becoming scarce in villages. Small plots of land were not enough to meet the need of a growing population. Peasants were looking for some additional sources of income. The proto-industrial system was a network of commercial exchanges. It was controlled by merchants. Goods were produced by peasants who worked within their family farms and not in factories. The finished product passed through several stages and reached the markets of London. From London, the products were supplied to the international market. The earliest factories in England came up in the 1730s. By late 18th century, there were numerous factories dotting the landscape of England. In 1760 Britain was importing 2.5 million pounds of raw cotton. This quantity increased to 22 million pounds by 1787. Benefits of factories: The factories increased efficiency of workers. Because of new machines a worker could produce better products in much bigger quantities. Cotton textiles were the main area in which industrialization happened. Managing and supervising the labour was much easier in factories than it was in the countryside. Cotton and metals were the most dynamic industries in Britain. During the first phase of industrialization (upto 1840s), cotton was the leading sector. The iron and steel industries grew rapidly with the expansion of railways. The railways expanded in England from the 1840s and in the colonies from 1860s. By 1873, the export of iron and steel from Britain was valued at about 77 million pounds. This was double the value of cotton export. At the end of the nineteenth century, less than 20% of total workforce was employed in technologically advanced industrial sectors. This shows that the traditional industry could not be displaced by the new industries. The cotton or metal industries could not set the change of pace in the traditional industries. But the traditional industries experienced many changes which were brought by small and apparently ordinary innovations. Food processing, building, pottery, glasswork, tanning, furniture making and production of implements were such industries. The new technology took a long time to spread across the industrial landscape. High cost of machines and costly repair scared the merchants and industrialists. The new machines were not as effective as claimed by their inventors and manufacturers. 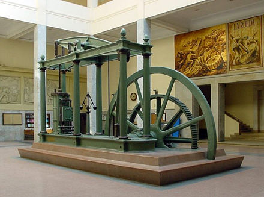 Historians acknowledge the fact that the typical worker in the mid-nineteenth century was not a machine operator but the traditional craftsperson and labourer. Hand Labour and Steam Power: During this period, there was no shortage of human labour. Because of good supply of workers, there was no problem of labour shortage or high wages. As a result, the merchants and industrialists preferred to manage with human labour rather than investing in costly machines. Machine-made goods were standardized and could not match the high quality finish of hand-made goods. The people from the upper classes preferred things produced by hand. The situation was different in nineteenth century America. There was shortage of labour in America and hence mechanization was the only way out in that part of the world. There was large scale migration from countryside to cities in search of jobs. Finding a job depended on existing network of friendship and kin relations. People without existing social connections in the cities found it difficult to find a job. Many people had to wait for long periods before they could get a job. Such people often had to spend nights on bridges or in night shelters. Some private individuals set up Night Refuges. The Poor Law authorities maintained Casual Wards for such people. Many jobs were seasonal in nature. Once a busy season was over, the poor were once again on the streets. While some people returned to the countryside, many stayed back to look for some odd jobs. There was some increase in the wages in the early nineteenth century. It is difficult to arrive at figures from various trades and fluctuations which happened from year to year. The period of employment was also critical in determining the quality of life of a worker. During the best of the times till the mid-nineteenth century, about 10% of urban population was extremely poor. During the periods of economic slump, the unemployment increased anything between 35 and 75%. Workers often turned hostile to new technology because of fear of unemployment. For example; when Spinning Jenny was introduced, women began to attack the new machines because they survived on hand spinning. After the 1840s, construction activity increased in the cities. This opened greater employment opportunities. The number of workers in the transport industries doubled in the 1840s, and doubled again in the subsequent 30 years.